Earlier this week we went on one of my favorite annual 3rd grade field trips at Eagle Cove School--we went to Sandy Point State Park. 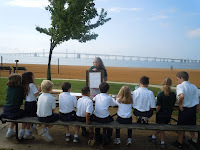 The reason we went to this Maryland State Park is because it served as the culmination of our bridges and river study. 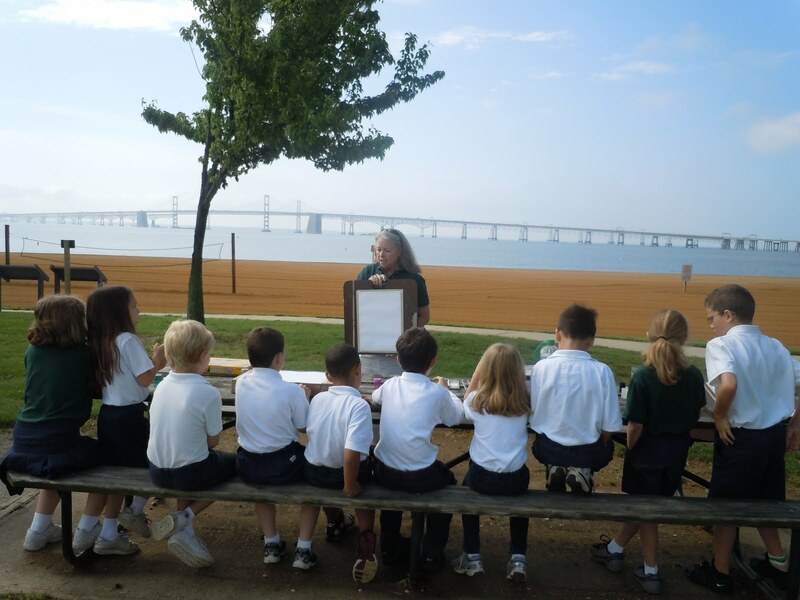 As we have found, this park becomes the perfect end-of-unit getaway in that it offers us an "up close and personal" view of the Chesapeake Bay Bridge, the gateway that connects the Eastern and Western shores of Maryland. It gives us a beach-side seat to discuss our newly acquired bridge terminology: bridge deck, piers, towers, abutments, truss, and suspension. 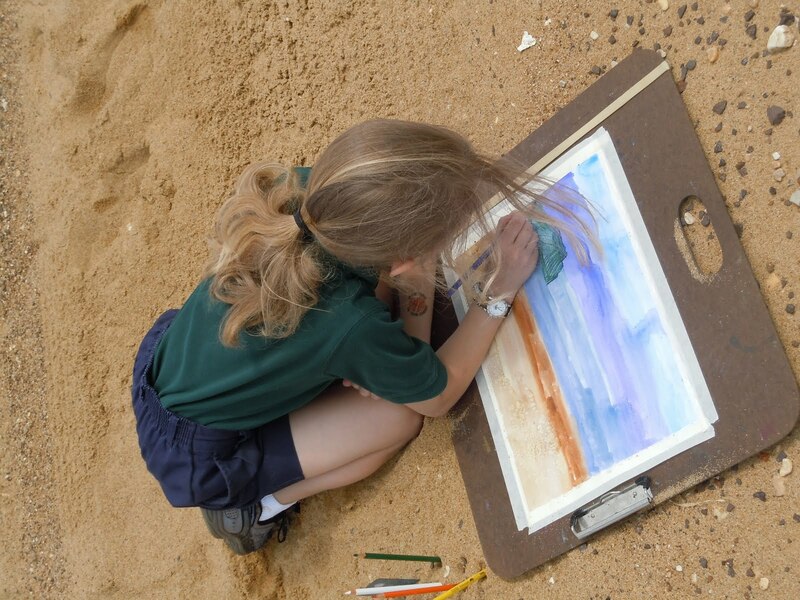 But more than that, it also gives us an opportunity to tie the content areas to the arts as we go out into the world--yielding over-sized clipboards, watercolor paper, paint brushes, and paint. We were also carrying a multitude of watercolor techniques. 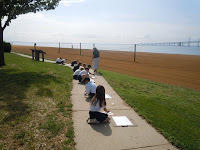 Additionally, our art adventure and Social Studies unit both lent themselves to an environmental conversation. Sandwiched in between both of these golden opportunities was a chance to share some powerful Plastiki quotes from the David de Rothschild book Plastiki: Across the Pacific on Plastic: An Adventure to Save Our Oceans. This in turn, made for a sensational segue into having our own personal beach clean up. We instantly noticed and were pleased by the pretty pristine-ly combed beach; yet despite that fact, purple sparkled in the morning sun. Purple? Ahh, a wayward scrap of foil from a random granola or protein bar wrapper. Add that to the hundreds of other colorful dime-sized, plastic items we found. In our little area alone, our crew was able to get a full grocery bag of tiny plastic scraps. These scraps were only a wind-blown-gust away from the water. Over time, that wind would ultimately carry all of it off to one of the 5 oceanic garbage patches filled with plastic trash, otherwise know as "mermaid tears," "nurdles," or "toxic soup." The Plastiki had been on my brain for about 2 weeks prior to our bridge trip. During that time, I had been aboard an airplane, and I found myself shaking my head. The reason? I was 30,000 feet above the ground, drinking from a plastic-encased bottle of water while reading the book "Plastiki !" (I was a thirsty girl from all that recirculated air--I needed hydration, and bottled water was my only option, despite my personal animosity to plastic!) I think this is what they call "irony." The exact amount of plastic entering the Pacific Ocean is unknown, and may be unknowable. But what is certain is that the Garbage Patch has grown in size, and so has the density of plastic within its vortex;. Each year, plastic litter in the ocean kills 100,000 turtles, dolphins, whales, and other marine mammals, and 1 million seabirds. So, this 3rd grade field trip for me wasn't just a great field trip. Instead, it became more like eco-tourism. "Eco-art-ism" perhaps is the better terminology. But isn't it true that this is what makes learning "real" to kids: True connections to real life. Hands-on experiences. Taking in the beauty and nature that surrounds us. 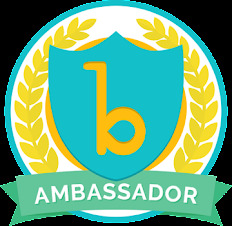 Being active and taking action. 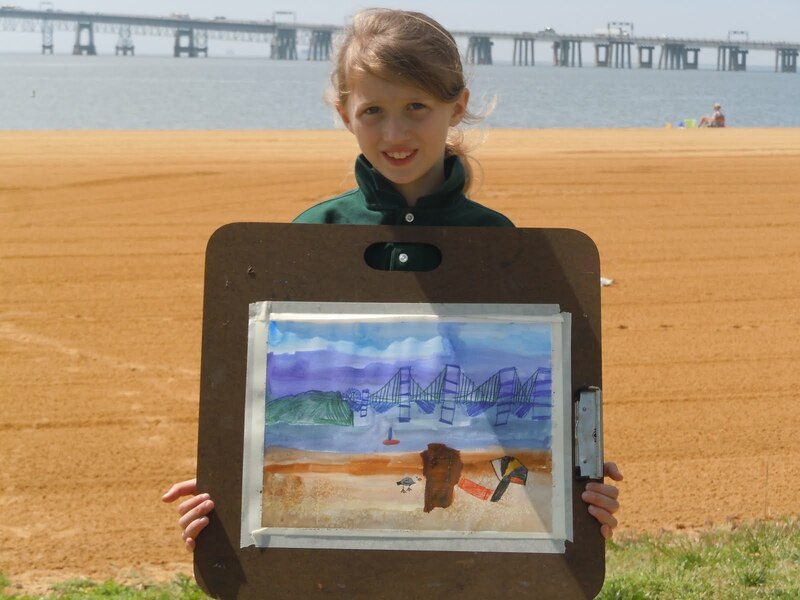 Gaining an appreciation for the Chesapeake Bay...seeing the fragility of our bay...protecting the bay. 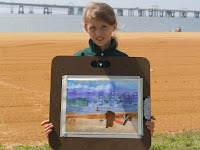 Perhaps more of our everyday learning experiences should include "eco-art-ism." 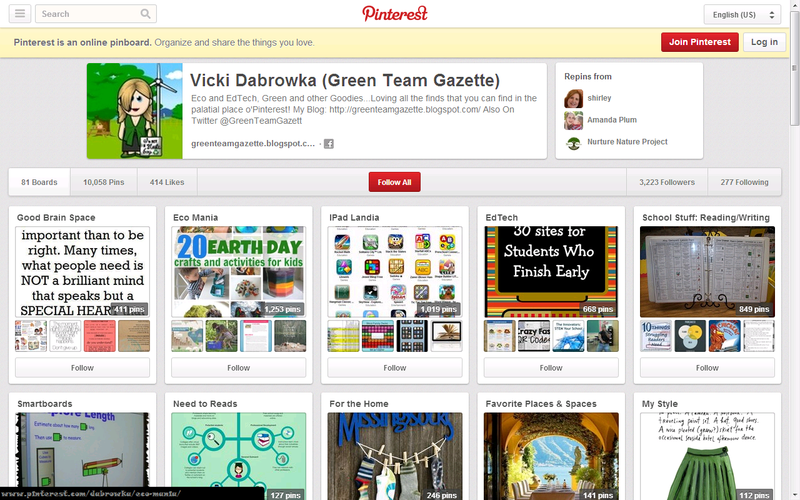 Great post-- keep up the great work making learning real for kids. I love the concept of "eco-art-ism!"